Posted on 5/18/2017 by Lori Moriarty. 0 Comments. If you want to stay relevant as a technically savvy professional, you need continuing SAP training. Because SAP is the 500-pound gorilla of ERP software. According to SAP they have over 350,000 customers in 180 countries and 15,000 partner companies worldwide. 87% of Forbes Global 2000 are SAP customers. There you go. Odds are high that you are going to be working for a company that has SAP. Are you currently an SAP end user? Great. Now it is time to be trained. Many companies use peer-to-peer training methods to get the new end users up and running. Though it may be enough to get the job done, there is so much more to learn. Imagine being able to use menu short-cuts that you did not know exist. With proper training, you can become your department’s Super User and position yourself for a promotion or raise based on your new level of proficiency. There may be a better (i.e. faster) way to do your reports and queries. You may never know these processes exist until you take an SAP training course. Looking for a new position or a new job? Your supervisors and future hiring managers will look at your SAP qualifications. Yes, of course, it is great to have experience as an SAP end use user. It is even better to show you went above and beyond and got professional skills training. You can take training for your specific career field. If you are in the human resources field, then earn a certificate as an HR Administrator, HR Manager or HR Payroll Manager. This kind of training is what will put your resume above the rest. Want an impressive resume on LinkedIn? Then just upload that hard-earned SAP Training certificate and let them know exactly how serious you are about your career. When you become a Certified SAP Professional, your credentials can be verified on-line by a third party. Remember to continuously update your LinkedIn profile as you change positions and take on more job duties. Reach out to others in your field and build your network because you never know who may be hiring. When you add your new SAP Certification be sure that your “share profile changes” button is in the ON position so that everyone can see your updates. According to PayScale.com SAP Certified consultants earn more than consultants without certification. 137 consultants with SAP training reported their earnings at $75K to $126K and 122 SAP consultants who did not have SAP training or certification reported $49K to $78K. Does this mean that the consultants without training are bad? Of course not, they may be even better at the job than some of the higher paid consultants. The point here is that perception is key. More training looks better. 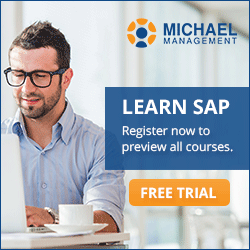 Why is motivating you to start continue your SAP training?